Only has sensors to detect fine particulate matter. No VOC sensor, hygrometer or thermometer. 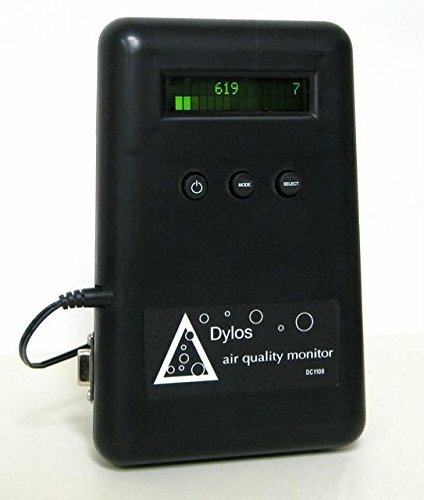 The Dylos DC-1100-PRO is very solid air monitor. For people who may need more accurate data than the average man, the Dylos is a no brainer. This device would be perfect for you. It's also great for allergy sufferers. The particle counter lets you know the air quality needs improvement before your allergies start acting up. The Dylos DC-1100-PRO-PC is the most accurate of the indoor air quality monitors we have reviewed so far. For example, it has the ability to monitor particulate matter as small as 0.5 micron thick. This unit is equipped with only two sensors. One sensor monitors small particulate matter (PM2.5) and another monitors fine particles (PM0.5). There are no thermometers, hygrometers or VOC sensors for this unit. Dylos traded versatility for accuracy and it paid dividends in that respect. The Dylos is designed very simply and has a slightly industrial look. It had a simple LCD readout at the front to display the 2 data points it monitors. The readout on the left shows the fine particle count. These are the particles that irritate the lungs and aggravate allergies. The read out on the left shows the number of larger particles. The simplicity of the PRO-PC extends to how you read and interpret its data. Dylos uses a scale from zero to 3500. Zero shows excellent conditions and 3500 is terrible. Units from Dylos are however not designed with connectivity in mind. The unit can only show the data. Whatever happens after depends on you. It’s therefore not suited to be at the center of a smart home beyond being a tool for information. The accuracy of the DC-1100 alone makes us rank it second on our list of best indoor air quality monitors despite it’s glaring weaknesses in comparison to other monitors. This unit is perfect for people who suffer from allergies. The accurate particle counting will warn you when allergy aggravating conditions arise and you can set your air purifier or HVAC accordingly. Unfortunately, this the DC-1100 isn’t a smart device that can connect to your other devices and handle this automatically. You must therefore constantly monitor the data and make adjustments yourself.